They think it's all over? Well Goal is here at long last, but will it take its place back on the footy game throne? Yes, it's finally here. Stop worrying, settle down, make yourself a brew, perhaps treat yourself to a choccie biccy or two and read on. Let me cast your mind back by more than a few years and remember the game that was Kick Off. Kick Off was a revolutionary product, and every man and his pet whippet loved it. I remember that fateful day when I first played it. There I was - and as I recall it was a Wednesday morning - and unfortunately I was bed-ridden thanks to a flu-bug flying around. I had mail ordered Kick Off and as if by magic the postie arrived that fateful morn and guess what popped through the letter-box? Yep, all thoughts of flu rapidly disappeared as I slapped the disk in the drive. Not only had I got the day off school, the world's greatest football game had just landed in my sweaty palms. My luckiest day ever? Yes indeedy. As for the game, it was quite simply one of the best I had ever played. You can look back now and it's a different kettle of fish altogether: the graphics aren't good and these days even Jimmy Hill could beat the computer 10-0. It had arrived, though, and back then I was the envy of all my friends. A year or so passed and things were beginning to hot up on the Kick Off front because news had filtered through to every kid's grubby ears, including mine, that a sequel was forthcoming. The sequel did arrive, and to much critical acclaim from the computer game press who heralded it as the best football game for any computer ever. I naturally ran down to the shops and bought it as soon as it was out and found out that was indeed ten times better than the original. Happy faces all round, but happiest of all was Dino Dini's, the creator of Kick Off 1 & 2. Another year had passed and talk of yet another Kick Off game was surfacing - Kick Off 3. Everybody who thought Kick Off 2 was the best it could possibly be had to have a re-think. In the meantime people had enjoyed the Kick Off spin-offs such as Player Manager, Kick Off Extra Time, Final Whistle and the super abundance of data disks. Then just as the rumour of Kick Off 3 was on the verge of being realised, a new,m young and pushy football game has forced its way onto the scene. Its name was Sensible Soccer, and that, my friends, is where all the trouble started. What is now known as the Sensi v Kick Off war erupted and it was so bad that even Kate Adie was reporting from the war zone. There were many casualties, some of which are still too disturbing to talk about. There were the Kick Off die-hards camped on one side while the Sensible Soccer young bloods were assembling on the other. In the middle were several youngsters who were just plain confused and didn't know which game to turn to thanks to misinformed friends and hapless game reviewers. I myself loved both Sensible and Kick Off and I just couldn't choose between the two no matter how I tried. Other people condemned me instantly and said that I must choose one of them and declare it the best. Why? Why must I choose between them? Well the simple fact is that I didn't choose. They are both different and they each have their merits and downfalls. There you have it... the truth. I don't want to see any kind of argument over which one is best ever again. If you really want to keep me happy then I suggest you buy both of them and hey, you never know, it might bring the world that step closer to global peace. Rumours were confirmed that Kick Off 3 was indeed arriving. And we waited, and waited and then waited some more until we could wait no longer. Virgin games must have got a bit bored waiting as well, so they decided to buy it off the original company and give it the new moniker of Goal. On the surface Goal, for all intents and purposes, looks identical to its Kick Off predecessors. Let's take a little look under that surface and see what new features we can dig up. First thing you notice is the graphics and the fact that there are three different modes. There is the normal zoomed in view and also a wider zoomed out vie, plus the standard setting where the computer swaps between the two views. Zoomed in view is the one you will use the most and the closed to the one used in Kick Off 2. An interesting feature is the ability to play Goal horizontally rather than vertically. This virtually creates a brand new football game for us Kick Off die-hards and it takes a bit of getting used to. Goal's graphics are noticeably better with improved animated players that are positioned in a well-drawn football stadium complete with athletic running track and Adidas sponsorship boards. The goals are also better defined and you get a more realistic feeling of scoring. The free kicks, corners, goal kicks and throw-ins have also been changed for the better. By moving a dotted line you are able to select the direction, length and height of the ball. The control system as a while seems to have changed slightly, but it still keeps the simplicity and playability that was a feature of Kick Off 2. Obviously, it helps to have played its predecessors, but even for the beginner Goal is one of those footy games that takes a minute to play, but a lot longer to master. Now I could be accused for being really crap, but when you put the computer at the hardest level it's bloody hard to beat it. Four people played the game and all failed miserably, so that means it should also give you a bit of a challenge over the months ahead. Unless of course you are all God-like computer games-playing prodigies. Replays have also been given a new look with the ability to play, stop, rewind and fast-forward the action. You can also watch it slow motion if the desire takes you. A new innovation is the introduction of the match report which appears at half and full time. You can look at it and it'll tell you how many shots on goal you had, how many saves you made, the number of corners, throw-ins, penalties and how much percentage possession you had. It's very useful for solving those depressing arguments that constantly rage when playing it with a chum or indeed a chum-ess. There are a few more options, but I haven't simply got the space to explain them all. You'll be able to find out all about them when you buy it, because believe you me if you don't you'll be laughed at in the street by small children. Goal is similar to Kick Off in many ways, yet totally different in others. For instance you do feel as if you're playing a brand new and totally original game, but it still has that feel of Kick Off about it. The new graphics are a definite improvement over its predecessors and the sound effects have been improved to further enhance the atmosphere of the game. The playability remains as fast and frantic as usual and the addiction factor is still at a danger level. It's a wonder how any of you lot managed to get your copy of Gamer this month because we've had to be physically prised away from our joysticks. Goal is a classic computer game and I personally would recommend it to everyone, whether they'd be young, old, small, big, large or skinny. If you are a Sensible Soccer fan then ignore Goal at your peril - you won't know what you're missing. Goal isn't better or worse than Sensible, it's just different... and very, very good. Goal is a major improvement on the previous Kick Off games. The graphics are cool, the sound is better, the playability is brilliant and you'll be addicted forever. What are you waiting for? Buy it. Dino Dino's sequel to Kick Off 2 is here, but is it Sensible enough to go to the very top of the Premier League? Do Amiga owners really need another football game? With over 40 of them out there on the market already, that is a difficult question to answer. Amiga football is, to coin a phrase, a funny old game, because it seems that no matter how many are released, they are all soaked up by a market hungry for new footy titles. To date, though, there really have only been three software contenders which offer you a decent game of football, and they are: Kick Off 2, Striker and Sensible Soccer. There are at least another four football games planned for release later on this year from various companies, but the one which is on most people's minds at the moment is the subject of the review. Goal! was programmed by Dino Dini, who is the renowned programmer of Kick Off 2, which for two years held the crown as the best football game around - until Sensible Soccer, that is. Now, Dino is attempting to reclaim the crown. Like Kick Off 2, Goal! is viewed from above the pitch, at a slight angle. The players are slightly larger than in the previous game, and the general look of the game is more polished. Two viewing modes are available, which enable you to zoom-in or out of the action. In zoom-in mode only a small part of the pitch can be seen at any one time, and the screen scrolls smoothly around to follow the ball. 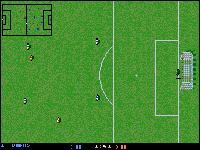 Because you cannot see much of the pitch, a scanner is provided which shows the position of the players and the ball as a series of coloured dots on a mini-pitch. When the ball goes out of play, the view switches to zoom out mode, so that more of the pitch can be seen and strategies planned more easily. This system works rather well - but if you do not like it the mode can be fixed on either zoom in or out. 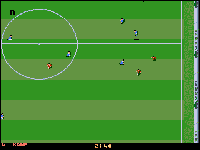 In most Amiga football games, the ball will automatically stick to your feet as soon as you touch it, so control is simple but limited. In Goal! the ball does not stick, but your players have their own momentum, which means they speed up and slow down as you move your joystick. This means that without using the fire-button it is in fact possible to perform some amazing feats of dribbling and control of the ball, just as long as you do not move too quickly. Also, as with Kick Off 2, you can actually trap the ball under your feet by simply holding down the fire-button. Kicking the ball away is achieved by letting go of the button. Fans of Kick Off 2 will be pleased to learn that taking corners and free kicks is now a lot easier and more logical than in the previous two games. Before the kick is taken, a dotted line is drawn away from the ball. This is controlled by the joystick, and is used to determine the angle, strength and trajectory of your shot. Throw-ins also use this method, though, which is a shame because now they tend to break up the flow of the game. In Kick Off 2 you simply pointed the joystick in the direction you want to throw, and hit fire - a much simpler and quicker method. The action replay facility has been extended over the previous games. It is now in the style of Striker, where the function keys are used to control fast forward, rewind and slow motion functions, very much like a video editor. When a goal is scored, the replay is shown automatically, as is the trend with recent games. The facility is also available for you to record all of the action replays within a game to disk. Another important new feature of Goal! is the choice between playing horizontally or vertically. This is an unusual option, included to satisfy those people who normally play games such as Euro Soccer where the pitch scrolls horizontally. Playing across the screen instead of down is very disconcerting at first, but the control, speed and movements are all identical in both directions. As well as offerings a different challenge, the horizontal pitch removes the fights between who plays up and down the pitch! Goal will remain on my playlist for a long time, but for me Sensible has the edge. OK, that is basically the new features of Goal!. For those of you who have not played Kick Off 2, you would probably like to know that all the usual features are included, such as after touch (so you can bend the ball after you have kicked it), the new back-pass rule, substitutions, formations and league. The most notable exception, however, is the lack of a cup competition. This, I am reliably informed, was due to the lack of time, and could be implemented in an update to the game sometime in the future. The sound effects are generally good. The only which is not convincing is the crowd noise which occurs as the ball moves towards one end of the pitch - it sounds more like a strong wind than several thousand baying football fans. There are a few other points about Goal! which could be made better. The most obvious is the incorrect team colours - for example, Liverpool play in the Manchester United strip - red with white shorts - which is really unforgivable, while Manchester United play in red with black shorts. The colours can be changed in the game, of course, but a little more care could have been taken in planning the kits. Next, in some kick-offs one of the opponent's forwards will stand inside the centre circle. This can be particularly annoying, and would certainly not be allowed in real football. OK, so this is only a minor point, but it is worth mentioning. As supplied, the team line-ups are sometimes a little curious. For some reason, depending on your formation - attack, defence, that type of thing - you will probably find that a defender has slipped into an attacking role, and a forward has slipped into midfield or even defence. This is extremely odd, and it means that you usually have to move your formation around before you start each game. Anyway, the teams may be played around with - players transferred between teams, and teams created, altered and transferred between leagues. All this information can be saved to disk, so if you take time to create your ultimate set-up, you won't have to do it again. Lastly, there is a niggly problem with selecting which joystick you use. There is nothing in the software to choose between joysticks, so if you have a favourite joystick you have to hope that the Amiga assigns it to you. Otherwise, you need to swap the joysticks between ports - which is not a fun experience when playing in a league. This is similar in style to the Kick Off 2 league. You can play up to 32 teams, each controlled by a human or the Amiga. You can arrange the teams to play each other up to 10 times, giving a total of 310 matches per team. (The longest match you can play is 40 minutes real-time, so the maximum amount of actual playing time from a single league is 206 hours, or 8.6 days). Because football games are always so subjective, we asked several footy players to comment about Goal!. Goal! is game of two halves. Half will send you over the moon and rest will make you feel sick as the proverbial parrot. The graphics and player movement are excellent but it is difficult to tackle, the throw ins and corners take an age, and it is tricky to counter a forward's mad rush straight down the middle. Goal! is a fine game, but it lacks the football 'feel' that Sensible Soccer captured. Ohhh God! Graham Taylor; the Premier League; Rovers relegated - football has had a season in hell. Happily, Amiga football is healthy. But is Goal! as good as Sensible? The footy fans' game, Sensible is fluid and open. Goal! offers big sprites, options aplenty and a table football feel, great for the kids. So... Goal! is a great Amiga game, Sensi' is the best Amiga football game. Goal! is a lot like Sensible Soccer, which actually I am not bad at. It is not as good though. I found trapping the ball tricky, and once I did get it, it stuck to my foot. The little men are well animated and run around with great energy. On its easiest level I found it winnable, if only because your men run much faster than the opposition. Overall, I like Goal! but it has not replaced Sensible Soccer in my affections. Where is it written that sports games have to play exactly like the game they purport to be about? Much is made of the fact that Sensible Soccer is more 'like' football than other footie games, yet it is still a collection of tiny sprites wandering around a green pitch. Goal! has a more fluid feel to it than Sensible, it is easier to pick up and more fun. I see it this way. Sensi' will appeal to those people who care about the colour of away strips. Goal! will appeal to those who like competitive two player games. Goal! plays effective, not pretty football. The frantic speed means you just blast it to the next player and hope they reach it first. Once inside the box, it is a turn and shoot job with massive aftertouch displacing true 'skill'. Kick Off 2, Striker and Sensible all had personality, something special to pull you through drubbings by Qatar. Goal! lacks this. It is thoroughly competent, but has a little of the Arsenal feel about it. It plays to win, and is a championship contender - but you would rather be watching Wednesday. Slick and pacey with choices of novice to pro play. I stormed into the first game amazed at the effortless way skilful passing, shooting and player control was (unfortunately by my opponent). Aston Villa under my supervision raced around like eleven men with 'weight' and 'drinking' problems. Still, after a few more goes, I got to grips and only lost 4-1 to Nutts. There was so much excitement I needed a lie down and the physio's wet sponge at half time! When these pretenders to the Sensible throne turn up you do have to give them a chance, right? Not perhaps for the purist, Goal! seems to want to be all things to all men. There are loads of options but not enough attention to detail, the game is a mish-mash of styles. Yet Goal! works. It is fast, exciting and immensely playable even though it is not particularly realistic - but who said it had to be? You do not get the sense of space that Sensible offers and the ball pings around like pinball. A bit gimmicky for me, but perhaps I am being overall fussy. It is good, it is solid, but it is not Sensible. My impression is that Goal! was written as an arcade game with some football elements, whereas Sensible Soccer was written by football fans as a real football simulation. As an arcade game, Goal! works really well. It is very playable, even more so than Kick Off 2, and the more you play the better your moves become. The flexibility of the game and scope for controlling the ball are much greater than in Sensible, but there is still the overriding feeling that something is lacking. Maybe it is that the throw-ins are too fiddly, or that sometimes the dying seconds of a match tick away while you are waiting for a corner to be set up, or simply that it is too easy to scream unchallenged up the pitch from the kick off and score. Anyway, I am sure that boat Goal! and Sensible Soccer will both remain on my playlist for a long time. They are both highly playable games, but for me Sensible definitely has the edge - and the comments from the rest of the team seem to back this up - it is still the definitive Amiga football game. Difficult to get into, but rewarding when you stick at it. With practice some excellent moves and one-touch play can be achieved. No cup competition, but the usual host of options (and more). Very intelligent computer opponents who do not just stick to set pieces - they actually seem to think for themselves. A fine arcade game, and a big improvement on Kick Off 2, but it does not have the feel of Sensible Soccer. Soccer-Games kommen und gehen, vor allem zu Zeiten internationaler Wettbewerbe entdecken viele Hersteller plötzlich ihre Fußball-Ader. "Kick Off"-Vater Dino Dini hat das nicht nötig, bei ihm erfolgt der Anpfiff, wenn das Spiel ausgereift ist: jetzt! Veteranen des grünen Rasens werden sich vielleicht noch erinnern, daß es bis zur Jahresmitte 1989 kein vernünftiges Fußballspiel für unsere "Freundin" gab - dann kam "Kick Off", und der Amiga war um eine Legende reicher. Der Nachfolger erzielte eine ähnlich begeisterte Resonanz, mußte sich ab Sommer '92 aber die Tabellenführung mit "Sensible Soccer" teilen, das quasi so eine Art "Kick Off 3" darstellt. Jetzt schlägt Meister Dini mit dem "Original" zurück, das nur deshalb anders heißt, weil er mittlerweile beim 1. FC Virgin unter Vertrag steht, sein Ex-Verein Anco jedoch immer noch noch die Rechte am alten Namen besitzt. Optik und Spielablauf sind daher im großen und ganzen gleich (gut) geblieben, aber natürlich hat Dino dem Game in der Zwischenzeit auch ein paar zeitgemäße Features antrainiert. Am auffälligsten ist da die neugeschaffene Möglichkeit, sowohl von oben nach unten als auch von rechts nach links (und umgekehrt) so spielen, was dann selbstverständlich auch vertikales bzw. horizontales Scrolling zur Folge hat. Des weiteren kann man sich den Platz in zwei verschiedenen Zoom-Einstellungen (n/fern) zeigen lassen, wobei es im freien Ermessen des Spielers steht, ob er selbst in bestimmten Situationen die Zoom-Stufe wechseln will oder dies dem Rechner überläßt. Wichtiger als derlei kosmetische Änderungen sind die Neuerungen im Verhalten der Feldspieler, insbesondere brauchen sie nun eine gewisse Zeit, um ihre maximale Laufgeschwindigkeit zu erreichen - ähnliches gilt für den Bremsweg, die Jungs können sich also nicht mehr verzögerungsfrei mitten im Lauf umdrehen wie ihre scheinbar schwerelosen Vorgänger. Der neue Realismus geht aber noch weiter, denn diese Beschleunigungs- und Bremswerte sind bei jedem Kicker individuell verschieden, genau wie im richtigen Fußballerleben. Und es stellt sich sehr schnell heraus, daß die Spielbarkeit darunter keineswegs gelitten hat, eher im Gegenteil: Man kann wunderbar dribbeln, stoppen, schlenzen, passen, den Ball mit Effet spielen ("Bananenflanke") und natürlich auch foulen. Ein weiteres Problem bei "Kick Off" war die schier unfaßbare Fangkraft des computergesteuerten Torwarts. Aus und vorbei, Dino hatte ein Einsehen und stutzte die Fähigkeiten der digitalen Schlußleute auf menschliches Normalmaß zurück. Im Falle eines Einwurfs, Freistoßes, Eckballs oder Elfmeters bestimmt man Richtung, Höhe und Stärke des Schusses bzw. Wurfs nun mit Hilfe einer gestrichelten Linie, was auch ganz gut funktioniert. Bei Freistößen erhält die gegnerische Mannschaft einige Sekunden Zeit, um die Formation der Mauer zu ändern; auf die (Wieder-) Einführung der Abseitsregel wurde im Interesse der Spielbarkeit verzichtet, die neue Rückpaßregel ist dagegen schon enthalten. Ein bißchen enttäuschend sind jedoch die mit Spannung erwarteten, acht verschiedenen Eigenschaftswerte der Cracks (Schnelligkeit, Ausdauer, Treffsicherheit...) ausgefallen, weil sie im Spiel selbst kaum auffallen. Anders verhält es sich mit den Computerteams, die als Mannschaft sehr wohl ihren jeweils eigenen "Charakter" haben und dadurch auch Solo-Kickern die nötige Abwechslung bieten. Eine recht lustige Geschichte ist auch der neu eingebaute Arcade-Modus mit fünf (Schwierigkeits-) Levels: Auf Stufe eins kriegt man für jedes erzielte Tor einen Punkt, am nächsten Level zwei Punkte und so weiter. Fast so unterhaltsam, aber ebenfalls nicht gerade lebenswichtig sind die vielen Statistiken, die Wißbegierige z.B. über die Zahl der Torwartparaden oder die prozentuale Verteilung des Ballbesitzes beider Mannschaften informieren. Ein echtes Kleinod ist wiederum die Replay-Funktion, sie bietet alle nur vorstellbaren Möglichkeiten wie normale Szenenwiederholung, Zeitlupe, Standbild, Rückwärtsgang und Abspeichern auf Disk. Absaven läßt sich hier überhaupt alles, angefangen vom Dress der einzeln Vereine bis hin zur kompletten Liga. Darüber hinaus sind natürlich die gewohnten Optionen und Features vertreten: vier verschiedene Platzuntergründe (Matsch, Schnee, etc. ), das nunmehr frei auf dem Screen plazierbare "Mini-Radar", gelbe und rote Karten, Trainings-, Liga- und Cup-Modi. Schön auch, daß zu den insgesamt 144 enthaltenen Teams die aktuellen Bundesligavereine mit den originalen Spielernamen gehören. Unter der Rubrik "enttäuschte Erwartungen" fällt dagegen das Fehlen einer Matchdauer von 2 X 45 Minuten, denn das Maximum sind 2 X 20 Minuten. Außerdem unterstützt das Programm weder Zwei-Button-Sticks noch einen Vier-Spieler-Adapter, man kann also nur alleine oder zu zweit bolzen. Optisch hat sich wie gesagt wenig getan, die Grafik ist einmal mehr funktionell und übersichtlich, aber nicht unbedingt ein Augenschmaus. Geradezu sensationell sind jedoch die früher arg kümmerlichen Sound und FX geraten, passend zum Geschehen tobt, schreit und stöhnt die Zuschauermenge, daß es eine wahre Pracht ist. Dino Dini is heading your way, with a whole new ball game. BOB: Good afternoon and welcome to the show. Today we're going to look at the comeback of a near legendary player, Dino Dini, and assess what he has to offer an increasingly competitive sport. TERRY: The boy Dino, 'e's a good who really understands the game. He's had a lot of well-deserved success in the past with Player Manager and the hugely popular Kick Off and Kick Off 2, and now he's back with er, Goal! BOB: Why's it not called Kick Off 3, Brian? BOB: But is it anything like Kick Off 2? TERRY: Well, Dino himself considers Goal! to be the natural successor to the Kick Off games, so yeah, it's really Kick Off 3 in all but name. BOB: Of course we've seen some fresh talent in the game since Kick Off 2's success, especially that young newcomer, Sensible Soccer. TERRY: Yeah, the boy Sensible, 'e's a good lad who really understands the game. In fact, he's the best player ever, according to us and all our viewers (Number One in the Readers' All Time Top 100 and Number One in AMIGA POWER's All Time Top 100. -Ed). He's really given Dino some competition while he's been out of the game. BOB: But do you think he can come back, Brian? BOB: So how do you think he's looking? TERRY: He's looking good, Brian, he's looking good. Detailed sprites with good animation, two zoom options, the further one with a Sensible Soccer feel, and the near zoom giving you a chance to really see the nitty gritty when you're dribbling and going for goal. Switching between the two is a simple matter of pressing the space bar, which you can do at any point in the game. When all is said and done, I'd say he's the best looking football game in the, er, game at the moment. BOB: Let's now go down to the ground and see the state of the pitch. Hello Brian, can you hear me? BOB: So Brian, what's the pitch looking like down there? JIM: Well, you've got a choice between dry, wet, muddy and Wembley (Wembley? - Ed) (No, it's Thursday. - Tim) (Me too, let's go for a drink. - Ed), and you can alter the wind speed too. Plus you can view the game horizontally or vertically, both with either of the zoom options. BOB: What's the visibility like? JIM: There's a scanner on-screen to show the state of play on the rest of the pitch, but you can move it around the screen if it's in the way of the action, or turn it off altogether if it simply annoys you. BOB: Thanks, Brian, we'll see you later. BOB: So it's certainly a good looker with lots of view options, but how is it playing? TERRY: well, although the control system's very much based on Kick Off 2, it's been vastly improved. It's really the opposite to a Sensible Soccer. You hold the fire button to trap the ball, and let go of it to pass to the nearest player in the direction you're facing. Dribbling the ball involves pushing the joystick in the direction you want to go, while shooting is just a press of the fire button, with aftertouch if you need it. BOB: All the standard options really. TERRY: That's just the start, Brian. You can chip the ball, by pushing the joystick up and down quickly, header when the ball's in the air, do sliding tackles - it's all there, and more. It's a bit more realistic to play, too. If you try to dribble too fast you lose control of the ball, but with practice you can perfect certain techniques including 180-degree turns (something you couldn't do in a Kick Off 2, and quick changes of direction. BOB: But is it intuitive play? TERRY: Well, I never found Dino's earlier games easy to get to grips with, but this is a lot better. You actually get the feeling that you're in control of the game and not dominated by it. A lot of people found Kick Off 2 too difficult, but with Goal! you can alter the difficulty level, which enables you to work at your own pace. Difficulty is really defined by how fast you and your opponent play the game, which means that at a low difficulty the game is actually slower than Kick Off 2, but at the highest level it's about 30 percent faster, which should give even the hardest Kick Off 2 pro a challenge. BOB: I've noticed that there's more control on the corners, throws-ins and free kicks too. BOB: Wasn't Boy George a pop singer, Brian? TERRY: I'd say that it has more control options than any other arcade football game. BOB: What teams will be playing, Brian? TERRY: All the Premier leagues are in there, with authentic home and away kits and up-to-date squads, as well as a full complement of international teams. You can also edit them to create your own custom teams, change the names of all the players and redesign the kit designs and colours, although the actual statistics of the individual players can't be altered, and the teams are all of differing standards. You can even choose the referee for the match, with each ref's statistics determining what percentage of fouls he spots and how tough he is on penalising. If a player gets away with a couple of fouls, he's more likely to get a yellow or red card when he commits another foul later on. BOB: Can we see that again, Brian? TERRY: Yes, you can get an instant replay of the action at any point during the game, and you can forward and rewind at fast, normal, and frame-by-frame. You can save any replays to disk too. BOB: Is there anything you can't do? TERRY: Goal! has certainly got more options and features than any other football game around the moment - it's stunning the amount that's in there. BOB: But is it an enjoyable game? TERRY: Well I'm happy to say the whole experience of playing Goal! is a thoroughly enjoyable one. It's a massive improvement on Kick Off 2 in every way. It's easier if you want it to be, harder if you want it to be, better looking, packed with options, boasts good atmospheric sound effects... and best of all, it's lots more fun. 100% percent improvement overall, I'd say. BOB: Is there anyone who can touch the boy now, Brian? The 'select teams' for the game. Each 'team' consists of eleven players who kick a spherical object. You know I said there were eleven players on a team? I lied. There's thirteen. It's just that they don't all play at the same time, you see. It's like having a paint program in your football game. Sort of. Except you can't ray trace with Goal! A random referee sounds fun. Perhaps he just walks around the pitch shouting things out at random. Like 'Carp' and 'Backgammon'. You can edit a player's name and shirt number but not his statistics. Those are the things that look like LEDs on your home hi-fi. The Arcade Challenge enables you to judge how much better you're going. You progress through the rounds with a win or tie, and get points on goal difference. UPPERS It's got everything you could plausibly ask from an arcade soccer game without being ridiculous. The difficulty settings help enormously to get into the game. Massive improvement on the Kick Off games, great to look at and good footballing fun to boot. DOWNERS Still not completely happy with the control system. There's loads of options, yes, but it somehow seems less obvious than the Sensible Soccer controls. The bottom line is that this is a very good football game. Some will love it more than anything else in life itself while others will still find the controls irritating and turn back to Sensible Soccer. You know which we prefer, but don't let me put you off, this is worth every penny, Brian. Goal! actually runs quite a bit better on the 1200, because it doesn't slow down when there's lots of players on screen. Dino Dini is back with a brand new football sim, and Paul Rand puts the boot in. When Kick Off was launched onto an unsuspecting world way back in 1989, it was hailed as one of the best football games ever, and Dino Dini became a software star overnight. When the sequel, Kick Off 2, hit the streets, it was hailed as THE best football game ever. A lot has changed since then; Anco, the company that published both titles, has since converted the latter game to a wide variety of console formats, Dini has parted company with Anco and moved over to Virgin, but he can't use the Kick Off name any more because it doesn't belong to him. Fans have been waiting an age for Dino to come up with the goods a third time - there's a new champion in town in the form of Sensible Soccer; after all - but how could he improve upon what is already a very classy title? Goal!, the latest in the Kick Off saga, is much, much more than just a re-tuned, boy-racer version of the original, although when you sit down and play you immediately realise that the unique control method which underpinned Kick Off's success remains. There are, however, a variety of subtle tweaks added to give greater depth of gameplay. The most important addition to the control of your characters is the ability of players to speed up and slow down on the ball. Keeping the joystick pushed forward causes your player to quicken his pace, which is useful when it comes to charging after an opponent who has the ball, but not terribly helpful for accurate control - more often than not, especially in the early stages of learning the rudiments of the new, improved system, you'll charge straight past your man. That's why it's important to gauge accurately the position your character should have reached in relation to the opponent in order to slow down, by nudging the stick as opposed to keeping it pushed fully forward. The gentlemanly art of tackling has been altered, too; it's impossible to run through the other players, and tackles are judged by the referee in order of severity. So, for instance, were you to go in for the ball from the side, the ref is likely to just wave play on or possibly award a free kick, but if you go in from the rear, it's more than likely that you'll be given a stern ticking-off or even shown a card. As Kick Off's free-rolling ball (as opposed to the ball being permanently glued to the feet as in practically every other soccer game before and since the game's release) was so popular, it would have been foolish to take it out. However, one complaint was the trapping aspect - basically, the player would stand on the ball and it would be almost impossible to wrestle it from him without sending him crashing to the ground and giving away a free kick - or worse. This has been rectified in the new version of the game; when the ball is stopped, it is positioned just in front of the character, allowing for more realistic tackling and, because there is less likelihood of the game being stopped due to a foul, the game flows more fluidly. The way the ball acts has been tightened up too; gone are the ludicrously long kicks from keeper to opposition 18 yard box which seasoned Kick Off 2 players used to their advantage; because there is no offside rule in Kick Off 2, you could pass the ball back to your keeper, wait for the opposition's defenders to move toward the ball and for your striker to move closer to the other side's goal. That trick can not be pulled in Goal!, because you can't kick that length of shot anymore, and also because the new back-pass rule, which Dino has incorporated into his game, does not allow keepers to pick up the ball when it is kicked to them. Offsides are still missing though - Dino felt they would stem the flow of the game, and I agree, but I believe there should at least be the option to play with the rule as it would add a greater level of challenge for experienced players. As in the previous two titles, Goal! contains a number of helpful options which allow you to tailor almost the entire game to suit your skills. A variety of difficulty levels have been included to help even sad, Gateshead Diadora League players attain Aston Villa status in a matter of minutes. And speaking of individual teams, there's an absolute stack of them incorporated into Goal! All the big players are in there, as well as a whole host of international sides. What is particularly impressive about this aspect of Goal! is that each side is made up of real players, and each player has his own statistics which mirror his real life form and general performance. For example, were you to select Arsenal (why on earth you'd do that I'm not quite sure) and take a look at Ian Wright's stats, you would notice that his aggression and goal scoring attributes are high, whilst his defensive and goalkeeping abilities verge on the laughable. There are around 3000 different players in there, and you can change the names of each to keep up with the transfer markets. Unfortunately, it's not possible to alter the actual statistics of the players, so you'll just have to hope that when, say, Manchester United finally decide to put Bryan Robson out to pasture, his replacement possesses similar qualities. Some hope. Dead ball situations have been radically altered. Whereas in Kick Off 2 success in these areas generally relied upon your ability to use after-touch to bend the ball around the field, Dino has used a brand new system in Goal!. The screen switches to a Sensible Soccer pulled-back view of the pitch, showing far more of the pitch than usual. When taking a throw-in or a corner, a dotted line appears next to your player. This line can be adjusted using the joystick to place the ball wherever you wish, within reason. Short or long passes can be made, along the ground or high in the air; this system takes some time to get used to, but once you have mastered its use it becomes second nature. While we're on the subject, I've also got to mention the fact that you can play the entire match using the Sensi view should you so desire. Again, it takes some getting used to, mainly because, unlike Sensible Soccer which was designed to be a slower, more strategic game, Goal! in mini-mode plays at the same hectic pace as it does in the normal close-up view. However, once you become accustomed to the pace of the game, you really do get the best of both worlds - the frantic arcade action for which Dini's football games are universally acclaimed, and the opportunity to do more than just kick and run because you can see more of the pitch, hence more of the players are in view and you can plan passes more easily than when having to rely on the scanner. That's not the only way to play, though; Horizontal view on the options menu and the pitch swivels through creating in effect a whole new ball game! The joystick controls accordingly, and it's actually much more satisfying to score a goal from this angle, as you can see more of the animation around the goalmouth. 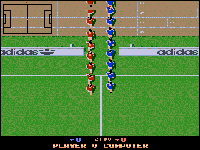 One of the 'features' of Kick Off 2 which many players figure out at an early age was the ability to score a goal from the centre circle by simply hoofing the ball in a straight line - if you timed the kick correctly by letting loose right on the edge of the circle, nine times out of ten the ball would sail over the keeper's head and into the net. This bug has been rectified Goal!, as has the other favourite which allowed you to run over the legs of an opponent in his six yard box, fall over and win a penalty. Having been a massive fan of Dini's soccer titles ever since I hold of the original Kick Off 1, I was not at all sure how much more he could do with the genre he created single-handedly. After all, the control system in Kick Off 2 is near perfect, graphics were a bit tatty in the original but they served their purpose and it would be daylight robbery to release a supposedly new game which turned out to be the prequel with a face-lift. But now that I've got my hands on Goal! and tinkered with it for a period of time, I can categorically state that Kick Off 2 has come out of the plastic surgery with a facelift, tummy tuck and liposuction on the tights and buttock region! The bare bones of the original are intact, but the subtle additions and alterations to the gameplay breathe new life into what could have been a tired old package. Graphically there's been a hell of a lot of work done, and now the basic footballers are hard and chunky and move around the screen with a high degree of class (even if the goalkeepers look a bit like Adolf Hitler!). Dino has taken a leaf out of Sensible Software's hefty tome and included a large amount of digitised sound effects, many of which are crowd noises which crop up throughout the proceedings - there's a particularly effective noise for those occasions where you slam the ball oft the goalpost too, which really makes the heart sink as you realise just how close you were to putting the pig's bladder into the back of the onion bag. The new perspectives that you can select in Goal! are a fantastic addition; both are like brand new games in themselves - the Sensi view really is akin to a supercharged version of Renegade's smash, while the horizontal game is a dream come true for all those who enjoy left-to-right scrolling footy but can't stand the ball sticking to the toe of your boot! For some time now, the pundits have been crowing about Sensible Soccer's majestic rise to the top of the championship table, shunting Kick Off 2 into second place. I never agreed with that view; I play both games regularly, and have always felt that the coveted crown balances precariously between the two titles. Or at least, I did until Goal! came along. This is without doubt THE soccer game to own - it's got far more gameplay and features than anything else around today. It's definitely the new benchmark for the genre, and you can bet your life that, as you read this, Chris Yates and Jon Hare will be doing the same and wondering what they can do with Sensisoccer 2 to stay in the arena in this battle of the computer footy Titans. WHO'S THIS DINO DINI GUY? Dino Dini sprang himself on the computer world quite unexpectedly. Interested in programming from the age of 16, Dino used to spend his spare hours writing machine code routines in his head! At the time, home machines such as the Amiga weren't widely available, so Dino used to compile routines from tables in books. With this firm background, he moved onto a kit computer - more like an oversized calculator than anything else - with which he wrote little games and programs. Nothing major, but from tiny acorns as they say. Then came the Anco episode. Anil Gupta wanted a football game, and as luck would have it Dino was looking for a challenging project. The two met and a firm foundation was quickly laid. After labouring on what would become the most revolutionary sports game since Track And Field, Kick Off 1 was finally released to the world, which at first just wasn't all that interested. Before long, however, everyone realised the error of their ways and Kick Off 1 become worldwide success. After that? Kick Off 2 and Player Manager, along with numerous data and enhancement disks. But then came the split with Anco, and Kick 0ff 3 was left in the balance. Whether one will ever appear is in the hands of Anco, but it definitely won't be written by Dino. He now lives on a tract of open countryside near Cambridge, where himself and Mrs Dini are expecting their first born (a teeny Dini?). Best of luck Dino! Since Kick Off 2, a few titles have stepped forward to take the crown, and in the eyes of many at least one of these titles has. Can Goal! swipe it back and place it on the Dini mantelpiece? Only time will tell. 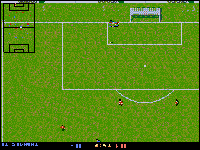 A slight upgrade to the original Sensible Soccer, version 1.1 was introduced right after completion of the ST version, itself an improvement on the Amiga release. A lot of people made a lot of noise about the game's similarity to Kick Off, most of all Jon Hare of Sensible Software who admitted quite freely that they had borrowed more than a couple of ideas. Essentially, they liked the game so much, they decided to do their own version! In essence, Sensisoccer is a souped up Kick Off 2, with improved goalkeepers and player tactics, but far smaller graphics! Steve Merrett went crazy over the first release, and really lost his top over this upgrade, awarding it 94% and a Superstar. Where can we go from here? Rage Software (formerly Special FX) made one hell of a start when they released Striker, one of the most original football games since Kick Off. Unlike Sensi Soccer and Kick Off, Striker uses a revolutionary 'down the pitch' 3D viewpoint to add depth to the game, and although this might sound a little off putting, It adds heaps to the game's realism and playability. Steve Merrett, ever one to pour his appreciation onto a good football game, also awarded this 94%, stating that it was 'The footballer of the year, and no mistake'. But that could always be down to the fact that he managed to thrash Rage boss Paul Finnegan by a mighty two goals. Ocean's new entry info the football world, and has yet to be reviewed, but going from the playable demo on last month's coverdisk it could be something rather special. Coded for Ocean by Audiogenic - who previously proved their worth by releasing the excellent World Class Rugby - the game features a brand new passing control method and a full replay system that lets you backtrack to the start of the match, freeze the action at any point and view the entire pitch to see who is where and includes various multi-player options. Whether it'll come up to the same standard as Goal! remains to be seen. We realised a long time ago that giving this game a bad review was a big mistake. When the future of digital kickabouts was released, mostly everyone shied away from it due to the smalil less than startling graphics and difficult controls. Scoring somewhere in the low 70s across the board, Kick Off was almost universally dismissed as 'another attempt to cash in on a popular sport'. Before too long, though, everyone was hooked. CU came out later and later each month due to extended lunchtimes playing, and one-time editor Mark Pattenden coined an interesting new phrase which we still rib him about when we see him. Unfortunately, the aforementioned phrase isn't printable, but it was very funny at the time. How could he possibly come up with a sequel? After all, Kick Off had flawless gameplay and everything you could possibly want didn't it? Well, in the words of Aussie teen idol Diesel, you never miss your water until you're dry. Kick Off 2 exploded onto an expectant scene and gave people far more than they could ever have expected. You want a set piece designer? You got it. You want improved graphics and gameplay? You've got that as well. The goal keepers were more intelligent, as were the computer-controlled players. You had a wider selection of tactics to employ - ones which actually made a difference to the outcome of the game! Even now, three years later, it's generally agreed that Kick 0ff 2 is the finest football game ever to appear, and so Dino has set himself one hell of a target to beat! By 1990, the Kick Off games had well and truly taken over the arcade football market. Anyone else would have left it there, being satisfied with taking over a field as experienced as that one, but not Dino. Keeping within the format of football games, he turned his attentions to managerial games with Player Manager a cross between Kick Off 1 and Tracksuit Manager. In Player Manager, most of the original Kick Off was evident in the arcade segment of the game, which might seem a little of a backtrack, but when you put it against a fully comprehensive managerial backbone, you have one hell of a title. Buying and selling players to create the strongest team you can, and then defining every aspect of their playing tactics, you could then step out on the pitch in your player manager guise and (hopefully) lead the team to victory. Not as easy as it sounds, but what a superb product. The definitive Amiga soccer sim - a must for every footy fan.